This week offers several chances to do both daytime and night sky observing with the help of amateur and professional astronomers! 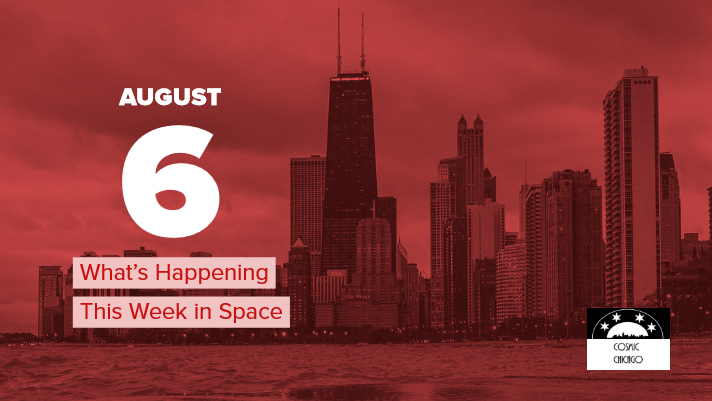 A free Chicago museum day and two rocket launches that you can catch online, and more, round out this week's space events. SpaceX Merah Putih Launch, Cape Canaveral, Florida, Tuesday, August 7th, 12:18 a.m.
SpaceX is launching its first reusable Block 5 Falcon 9 booster for the Merah Putih launch early Tuesday morning. You can watch the launch live on SpaceX's website. 'Scopes in the City, Horner Park, Tuesday, August 7th, 8:30-10:30 p.m. The astronomers of the Adler Planetarium join up with the Chicago Astronomer and The Chicago Astronomical Society to bring the night sky to families and neighborhoods across Chicago. These events are free, but keep an eye on the Adler's social media accounts for weather updates. 'Scopes in the City, Thurgood Marhall Branch Library, Wednesday, August 8th, 12:30-2:30 p.m. This daytime public observing event with astronomers and staff from the Adler Planetarium will focus on solar observing. The observing event page will post weather updates so be sure to bookmark it for reference. Field Museum Free Admission Day, Field Museum Thursday, August 9th, 9:00 a.m.
During the Field's free admission days Illinois residents get free basic admission to the museum. At the Field Museum you can explore the impressive meteorite collection found around the world, which are curated in the new exhibit that is part of the Robert A. Pritzker Center for Meteoritics and Polar Studies. 'Scopes in the City, Hall Branch Library, Thursday, August 9th, 11:30 am.-1 p.m.
Another daytime solar observing session that is family friendly and open to the public. Keep an eye on the Facebook event page for updates because observing is weather permitting. 'Scopes in the City, Coleman Branch Library, Friday, August 10th, 11 a.m.-12:30 p.m.
With school about to begin, the Adler is providing ample opportunities for families and students to try telescope observing with professional astronomers. Bookmark the event page to be updated in case the weather makes observing difficult.